Kurt Schuett paints an engaging picture when he writes which makes him an excellent storyteller. The book was intriguing and the plot twists kept me entwined from beginning to end. I also enjoyed the subtle journey though the history and geography of the Chicago area. I'm looking forward to the next book. This is hands down the best book I've read in ages. Kurt Schuett's work, Insurgency, is a hypothetical debut novel, which primarily incorporates various aspects of urban thrillers, suspense, actions and horrors, as well as political conspiracy. According to Schuett, the country appears to be in actual decay, and the citizens nurturing a feeling of complete hopelessness. This perception actually makes the tale rich with elements of political unrest. This is specifically manifested in the level of anti-state developments and complexities thus making it a lifelike thriller. Schuett actually proves to be outstandingly brave with his writing, especially regarding this particular work of fiction. Protagonist Alan Schulz is a character well created by the author to represent the everyday graduates, who cannot find good jobs yet have personal grievances against their immediate societies. Kurt Schuett paints Alan, a young law-abiding citizen turned a serial murderer in the City of Chicago. Kurt Schuett also creates a creepy and unnerving inner-city environment where nobody is considered sacred. He depicts Chicago as a dark and daunting city with hard-hitting tales, particularly characterized with turmoil, conspiracy, street riots, and murder, among many other evils in the society. Worst of all are the experiences of the central character, which has been dragged unintentionally into the midst of all these unnecessary mayhems. The sequence of actions in the book is well-fashioned. For instance, there is a number of sincerely shocking moments, which are somehow capable of instigating fear in the readers. Other than the fast-paced actions, Schuett's characters, both villains and heroes alike, also make both emotional and timely observations about both the modern and future United States of America. As a result, all enthusiasts of horrors, thrillers, suspense, actions, as well as political conspiracy are expected to enjoy the debut novel. A man in a bespoke suit swings from a noose made out of an American flag. Outside, Chicago looks like Mogadishu. This is our first - and also our final - glimpse of Kurt Schuett's titular INSURGENCY. Schuett then rewinds the tape and takes us back to the current day city, frumpy, but functional. In the wake of the Great Recession, no one is particularly satisfied with their lot in life, but no one is exactly taking to the streets in violence, either. That journey from point A to point Z, when the identity of the hanging man is finally revealed, takes up the rest of the narrative. I'll admit, I thought I had guessed who the dead man was about four or five chapters in, and I was stunned at how wrong I was. In fact, that little bit of misdirection was enough to completely pull the rug out from under me. With INSURGENCY I was expecting something a bit smallish, I don't know what exactly. A fluffy political thriller, let's say, like FIVE DAYS IN MAY, about an attempted small-scale insurrection that is squashed through the hearty effort of a few plucky heroes. Instead I was presented with a nihilistic novel of dark spec-fic or maybe even horror depicting the opening days of a full-scale global revolution. As the stakes rose before my eyes I kept expecting that the peak had been reached and Schuett would begin reeling things back in, but, nope, the stakes kept right on rising until the very last page. I would be lying if I said this was a perfect novel. The dialogue is clunky, and the motivations of almost every character are muddled. I'm still not 100% sure what the insurgents wanted, although maybe that was supposed to be a mystery to be revealed in future installments of the series. If it was supposed to be a mystery, though, that wasn't clear, and they sure seemed to pontificate and bloviate an awful lot about their lofty ideals without ever really explaining them. After the initial in medias res opening, the beginning was a bit slow and the middle was a bit saggy. In other words, INSURGENCY suffered from a typical case of debut-novel-itis. Where INSURGENCY set itself apart from its peers, though, when it really started to hum, was when the endgame began. I've already stated how astonished I was that Schuett managed to gradually expand the scale and raise the stakes until I didn't even know what genre I was reading anymore. This author has a gift for turning the screws. One particular scene in a hospital was...jarring, to say the least. Similarly there was research here, research that made me say, "Damn, this is plausible." If this all happened...this is the way it would happen. Schuett shows a real skill for description, and his action scenes are white-knucklers. Keep an eye on this guy. I predict he'll be a real talent to watch. I recommend it to people who like dystopian serial novels. 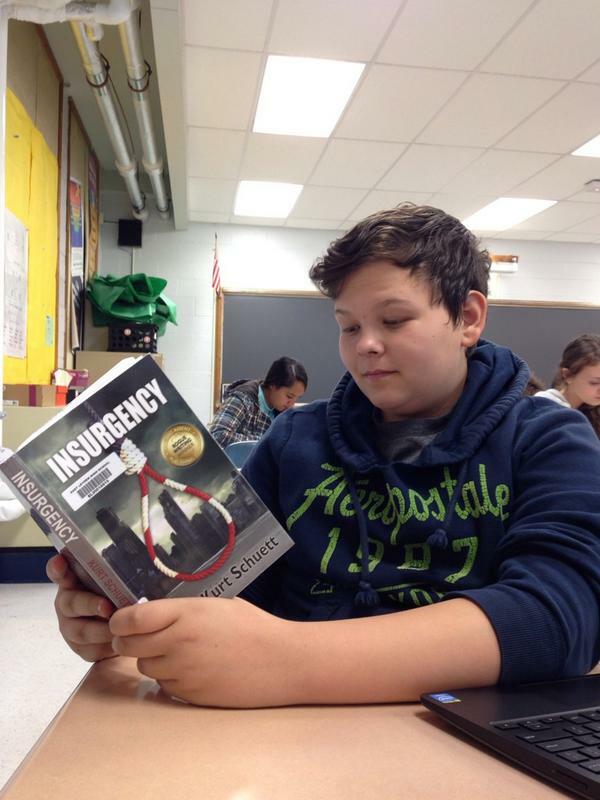 First thing, Insurgency is the first book in a serial series. That means that even when you finish reading this book, you aren’t done. You have to read the next book, and the one after that and so on. I know that a lot of people like serial books, I’m just not one of them. If I had known before I started reading Insurgency that I was starting a serial, I wouldn’t have read it. That being said, it was a good book. I liked it. The characters were interesting, and the action was good. It takes place in a near future Chicago, and has a mildly dystopian feel to it, but feels quite believable. The country seems to be in decay. There is a feeling of hopelessness. But is the solution to the problem a fix or the end of civilization? We will have to see. Mr. Schuett knows how to tell a story, I just don’t know where the story is going. He can write the first part of the story, but can he finish it as well? Can he bring all the elements to a believable and satisfying conclusion? When will we know? I give Insurgency 3 Stars out of 5, and recommend it to people who like dystopian serial novels. If the book description sounds interesting to you, I’m sure that you will like it. If you are from Chicago or the Chicago area you will really be able to feel as if you are right there. His writing is excellent....can't wait for the next book. Gripping & Intense! Like nothing I've ever read! Wow! This book will keep you on the edge of your seat! Buckle up for this incredible ride. I love action, drama, and crime solving movies and TV shows, but I've never read a book that had me on my toes through the entire thing. Read this book because you're gonna see it on the big screen eventually! One of the best books I have ever read. I recommend it for any and everyone. I'm so blessed to have been able to have had Kurt as my teacher back in high school. I'm currently reading the book for the second time now. First off: This novel mentions "Fraggle Rock", "American Psycho" (the film) and Stephen King. You have to love that. Plus, they are mentioned in such a seamless way that it doesn't feel as if Schuett is name-dropping for the sake of name-dropping. "Insurgency" is simply written, almost YA in nature, (except for the blood, death, chaos, language etc) but done so quite well, deeply detailed. Schuett is never lazy with his words or stingy. He paints a world of real life horror, his words a paintbrush. No "See Jane Run" here but more of a "Watch as Jane's feet eat away at the asphalt, effortlessly propelling her forward". The backdrop is executed well, the story-line interesting. The plot moves forward at a smooth pace that begins to grab you and practically forces you to turn the pages as fast as possible... but characters don't flow as well. Perhaps it is not the characters themselves but rather, at times, dialogue comes across as forced. Conversations don't ring true and are stiff. This is especially true of Alan's inner dialogue with himself. Alan also mutters quite a bit and "audibly" at that. Lots of "sneering" too, by different people in the book. I was extremely pleased with a main character that "suffers" from O.C.D.. I'm not quite the hand-washer that Alan is yet I know how it feels to live with those little details that everyone else ignores or never sees. To have a front and center character like that? FINALLY. I HATE talking to someone through an intercom and if I must do so, I rub/scratch my arm excessively til the transaction is completed. Something I never knew I did, til family pointed it out. Alan and the leg rubbing was too true-to-life for me. And BOO on you, Mr. Kurt Schuett for not forewarning me that "Insurgency" was book #1 in a series. Here is to hoping I can get my hands on a copy of book 2, sooner than later because I need to know the endgame in this! But props for being about to throw me off with that unexpected end of a friendship. I adored that move. This one is for you schuett. You the man. Keep on keepin on. Good read and I hate reading! Schuett does a great job of creating a disturbing, but entirely plausible, world of chaos. Sometime halfway through this novel, you feel the noose tightening as the pace of this thing just becomes overwhelming. In the end, so many of the horrifying images and relentless action scenes will haunt you long after you put this down. A really fun read. Just started reading Insurgency once again and I have to say, a VERY original and methodological method of storytelling that starts with an unordinarily-ordinary guy and progresses into a true tLook who Stafford plays in the playoffs hriller. Leaves you craving another reading session. Definitely enjoyed how the protagonist gets thrown into the whole situation without a choice at all, very realistic and gripping! A debut novel for Kurt Schuett....and definitely a success. Keeps you wanting to turn the page, wanting to know the next twist, the next turn, waiting for the next scene to play out.... Only you don't have to wait very long as it keeps you highly engaged. Very well written, leaving not one sense untouched or unprovoked in one way or another. Job well done. Great book that grabs you from the beginning and doesn't let go until it takes you through horrifying roller coaster ride of death, destruction and gore. It is a very entertaining book and I highly recommend it to those who love action and horror. A terrific read that gripped me during a long haul flight from Australia to England. A seat-of-your-pants, no-holds-barred romp through the streets of Chicago with drugs, murder and mayhem a-plenty, seen through the whiskey-addled eyes of a poor Joe. Go on, you know you want to. Though provoking, gripping intense...Fantastic! A must read ! Alan is a down on his luck average guy. He just left his boring job as a test scorer and meets with a friend at a local bar. A group of college kids decide to randomly spike his drink with a drug "Red Phase". Alan has no recollection of what he did, he just finds evidence that he has killed someone. Later he learns it is more than just one. Not knowing what to do he calls his friend George an attorney, who advises Alan to turn himself in to the police. Once in jail things turn really bizarre. A Black Bloc group (with military skills) known as The hand gets him out of jail, leaving Alan to wonder why. Soon he is about to find out and (he) does not like what he is dragged into. The "Brotherhood" has plans to use this Red Phase drug in mass proportions during the upcoming Chicago G20 Summit. The entire City of Chicago, the members of the Summit, including the President of the United States are all in danger. Will Alan be able to stop this group? Will he be able to save himself? And who can he trust? An intense psychological/action/urban/suspense, that will leave you at the edge of your seat and up late into the night. I loved the story, the frighting aspect that something like this could really happen made Insurgency even more gripping. Well written with vivid details, really grabs the reader into the story and won't let go. I highly recommend to those who love a nail biting, page turning fantastic story of suspense. Kurt Schuett is an Author to watch. *This book was given to me as a gift. A suspenseful novel that takes place in my favorite city; Chicago. Kurt Schuett does a remarkable job keeping you intrigued in a way that all can relate. Schuett was able to directly correlate the proceedings of the novel with current events by transmitting politics, local city details, and present day matters into an action packed thriller. “The greatest feats of human history, and the worst infamies, have all developed through those with nonconformist notions who were willing to change and deviate from the herd in order to secure a new direction for the future.” A meaningful passage from the novel that has held true for centuries and will continue to shape our future generations. Definitely looking forward to the sequel! In the beginning, there is a very good first chapter title: In the Beginning, There Was Unemployment. What separates Kurt Schuett's novel Insurgency from the growing numbers of reader-disturbing apocalyptic fiction is that this novel is grounded in an understanding of why a mass of people may revolt and turn to terror. After all, it truly is in the eye of the beholder as a famous old political cartoon of Ronald Reagan put it, which ones are the insurgents and which ones are the freedom fighters? Imagine, as Schuett did, a group of people who have become so disaffected and disenfranchised by society that they wish to strike back against it. How best to go about that? There are of course the usual methods: bombing, kidnapping, or perhaps attacking corporate computers. All have proven successful in both the worlds of reality and fiction, yet all are limited. Not to sound utterly callous about it, but a bomb destroys one building, kills those unfortunate enough to be in its immediate vicinity, and the result is that the corporate state clamps down even firmer on the aggrieved. Would it not be much more effective to destroy from within, by turning the comfortable into the uncomfortable? Yes, it would be much more effective to turn the weakness of the target against itself. So what then is the targeted weakness in the people of Insurgency's Chicago? There is a simple one word answer: drugs. And so it is that the insurgents here invent a narcotic named Red Phase, with one assumed the name chosen from making the takers 'see red.' As one of Schuett's characters describes the effect, "This Red Phase supposedly numbs people entirely, causes them to become hyperactive, aggressive, and can cause both euphoric and paranoid reactions, depending on the individual." Flood the street market with this stuff and enough of the subconsciously angry - even the consciously bored - would transform from so many mild-mannered Bruce Banners into legions of raging Incredible Hulks. Smash! This, one must say, is an excellent set-up for a novel; so the question then is, how well does the author execute it? The answer is, very well indeed. His protagonist Alan Schultz is just another guy who works at a dull office job (he marks standardized tests for a living - lucky him!) who has a shot of Red Phase slipped into his Friday after-work drink. Complications arise, in the form of a trail of dead bodies that are the result of Alan murdering them, as he realizes to his horror when the effects of the drug wear off. He is this resolved to set things right. Where Schuett is absolutely brilliant in his plotting is in describing what the reaction of government is to this latest pandemic. There is a G-20 Summit planned for Chicago. Yes, it is ludicrous to put such an event in a large city, but on the other hand that is exactly what happened in Toronto just a few years ago. Thus, the corporate state cracks down on personal liberties, the streets are armed with the National Guard, and with that as the result it becomes an interesting debate as to whether or not the drug lord insurgents actually have won. The nation is destroying itself from within. I note from his biography that Kurt Schuett is also an award-winning poet. It shows. It shows not in the way one might reflexively expect - he is in no way a florid or purple writer. No, he understands the economy and vivacity of words; how words can manipulate a mood with equal (yet hopefully more benign) effect that a Red Phase drug. I truly look forward to reading more of his work. This thriller kept me turning pages throughout by recreating the great city of Chicago with rich local details--and then presenting its destruction at the hands of a terrifying outbreak. The action sequences are particularly well-crafted, and there are a number of genuinely horrific moments certain to make readers remember, and fear, the Red Hand Brotherhood for a long time. Alongside the fast-paced fireworks, the author's characters (heroes and villains alike) make timely, poignant observations about our modern United States. Fans of political intrigue, action, and horror will find a winner in this debut novel. Welcome to a new mystery writer! Absolutely great to welcome a new mystery writer to Amazon. Kurt not only did a great job on character development but also had many new twists and turns in solving the mystery. I read a lot of mysteries and usually know the bad guys halfway thru the book - not so with Insurgency. Everyone needs to tell the author to get started on a sequel; Kurt Schuett is definitely an author that I will put on my favorite author list. Kurt Schuett has written a wonderful debut novel. He's a very good and capable writer. His words and sentences create a visually clear picture in your mind as to what is actually happening in his book. The plot is mesmerizing, tightly wrapped, and the book is worth reading for the surprise ending alone. You will enjoy reading about his main character, one Alan Schultz a normal kind of guy who has OCD and gets wrapped up in a sinister underground terrorism plot. 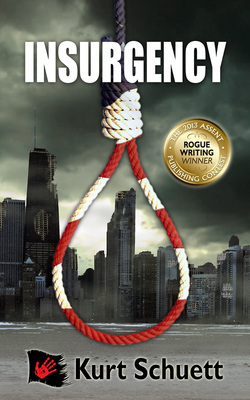 Set against real life locations in Chicago Illinois, INSURGENCY is a great read. I'm looking forward to Kurt's next novel. The author does his genre proud with this fast-paced action thriller which is full of horror, terror and creepy shadowy types who kill first and can't be bothered with any questions afterwards. He creates an eerie and sinister inner-city atmosphere where nothing and no one is sacred. Portrayed against Chicago's ugly underlife the author has written a dark and scary, hard-hitting and raw and gory story, full of murder, mayhem, conspiracy and street riots which, for the protagonist, who has unwittingly been dragged into the midst of it all, borders on a never-ending nightmare. Sometimes the descriptions of the killings sound like a video game with the images being computer figures that don't act like humans or die human deaths but just appear or fade away seemingly at will. The characters thus work contrived. But this is the genre and the action is the driver. So if action and terror are your thing and you like a story capably told, you will enjoy this book. An Average Joe caught up in riots and the budding seeds of a Chicago-style rebellion? Sign me up! Finally a thriller that takes place in Chicago, my favorite city! A non-stop fast pace read that keeps you engaged through out the story. No spoilers, but some of the scariest scenes I have ever read happened in this book! Really looking forward to the second book in the Red Hand Brotherhood series! Alan Schultz is your everyday graduate. Can’t find a good job, has his own personal grumblings with society, and is very, very OCD. So maybe Alan isn’t the everyday guy, but he was a character that Kurt Schuett really created very well. Alan was a character that I enjoyed reading about and irritated me as much as he entertained me, which any personal in the real world is sure to do, so thumbs up for a strong protagonist. Alan is thrown into the middle of an underground domestic terrorist group after he is roofied at a local bar and boy do things get turned upside down for Alan. A massive underground movement has begun with a little help from a new street drug called “Red Phase”, a drug that turns people into wild, cold blooded killers. Alan, with the help of his attorney friend George, must race against time, the law, “The Brotherhood” and the elements, through Chicago, to see if they can stop the terrorist group from overthrowing the government and casting our country into the shadows of total anarchy. Insurgency was a bit slow out of the gates for me. Schuett does a beautiful job of being descriptive, but in my opinion, sometimes less description is more. Once you get passed the “underground” you’ll start to notice the book really digging its claws into you. Schuett becomes braver and bolder with his writing and Allan Schultz becomes what I feared he’d become from the get go; an innocent man trapped in a whirlwind of calamity in which he’s forced to do terrible things. There are a few scenes that are a bit vague that require some rereading in order to understand, but it’s a part of the book that you can really look past. The story is so rich with political depth and there is a level of anti-government planning and intricacy that truly makes this a thriller…and a realistic one at that. In the world we live in today, anything can happen, especially very scary things, and Schuett has truly proven to me that he is a master of putting pen to paper in Insurgency. I anticipate the follow up to this novel, especially after that jaw-dropping ending. This is definitely a book worth reading and I recommend it to any lover of political fiction, suspenseful thrillers, or action adventure! Now Available at Barnes & Noble, Amazon, and Apple. Assent Publishing’s Bad Day Books imprint is thrilled to announce the winners of the 2013 ROGUE WRITING Contest. Wow! What a contest. We really enjoyed reading submissions from every corner of the world and the genre spectrum. There were nights we slept with the lights on, some we were up all night reading, and others spent all night laughing. Emotions ran high as we were lead through the desperation of an apocalypse, bit our nails as we rapidly turned the pages to see what came next in a thriller, and occasionally grabbed a tissue to catch tears of laughter from a bit of stress relieving humor. With rich characters tugging at our shirt sleeves and such great talent to choose from, we rigorously reviewed the best of the best and chose the winners of the Bad Day Books Rogue Writing Contest. 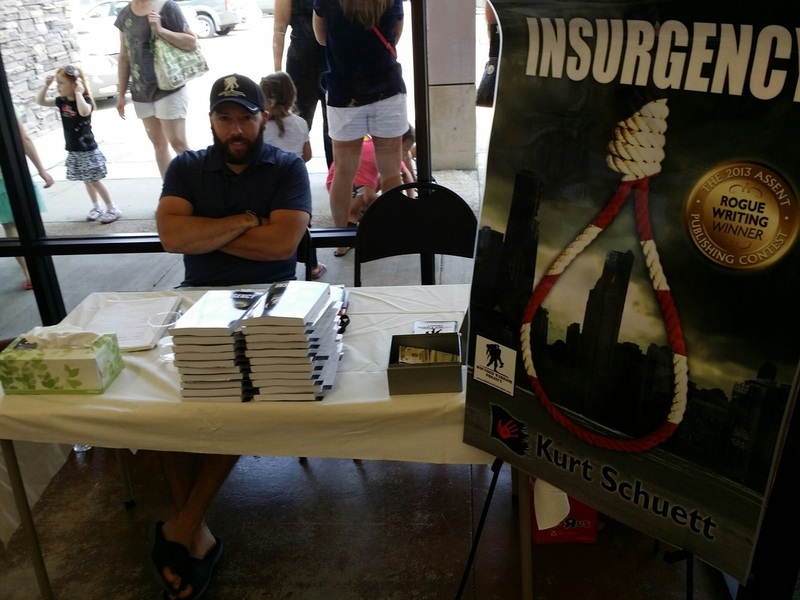 Our GRAND PRIZE WINNER is author Kurt Schuett with his wildly imaginative apocalyptic thriller Insurgency. OCD afflicted Alan, a Generation-X do-gooder turned serial killer, is the only thing standing between the President and his assassination at the G20 Summit. Insurgency is Kurt Schuett’s debut novel, a speculative work of fiction that encompasses elements of urban suspense, thriller, and horror. Kurt Schuett knew early on that he wanted to write. Upon graduating from high school, Kurt Schuett won the Gwendolyn Brooks Award for Poetry in 1993; this honor, coupled with professional publication in The American Goat literary anthology in 1993 with The First Time and Harmony literary magazine, where he won the esteemed Guy Cooper Poetry award for Tree House Blues, all fueled the realization that Kurt could and should write, dabbling in everything from poetry and short works of fiction to professional essays and lengthier works of fiction during and after his college years. He completed his undergraduate in English at Culver-Stockton College before tackling a Masters of Education at Graceland University. Currently, he is entering his seventeenth year as an educator, formerly as a German instructor and presently as a high school English teacher, working in the suburbs of Chicago. He lives in the northern suburb of Libertyville, Illinois. Mr. Schuett recently published a Southern Gothic ghost story titled Calamity James in the Belle Reve Literary Journal, a work that was just nominated for the Pushcart Prize. Mr. Schuett has contracted with Assent Publishing and receives all benefits offered including professional editing, professional cover design, print and ebook formatting, distribution, intense marketing training through the Assent Academy, and the unparalleled Assent Publishing commitment to author success. Among his prizes are a two thousand dollar promotional announcement blitz when Insurgency is released in 2014, ten one-on-one sessions with Author Success Coach Deborah Riley-Magnus, a membership with Horror Writers Association, and a Kindle Fire! Tune in for his posts on the ROGUE WRITING Grand Prize Winner Blog! Kurt Schuett has taught English at Leyden High School District 212 since 2000, although he’s probably better known as the varsity softball coach. In July, he’ll add the distinction of being a published novelist. As if that’s not enough, he organized a fundraiser for a Chicago nonprofit that assists people with obsessive compulsive disorder, an anxiety disorder where people have unwanted and repeated thoughts, feelings, ideas, sensations or repetitive behaviors. 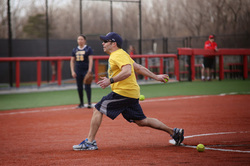 The fundraiser took place on April 26 at Bandits Stadium in Rosemont. Q. Why did you choose to study English? A. It was a really difficult choice for me. My father was a Golden Apple winning teacher at Morton School district then a college professor at Benedictine University. Social studies was very tempting for me but I had a couple brilliant English teachers at high school plus I’ve always enjoyed creative writing. Q. What’s your background in softball? A. I was a baseball player in high school and college. I got a half academic and half athletic scholarship. I played for four years. Q. There are a lot of good causes out there. How did you come to pick obsessive compulsive disorder as a cause to raise money for? Q. What’s the other reason? A. I actually sold a book deal. I wrote a novel. 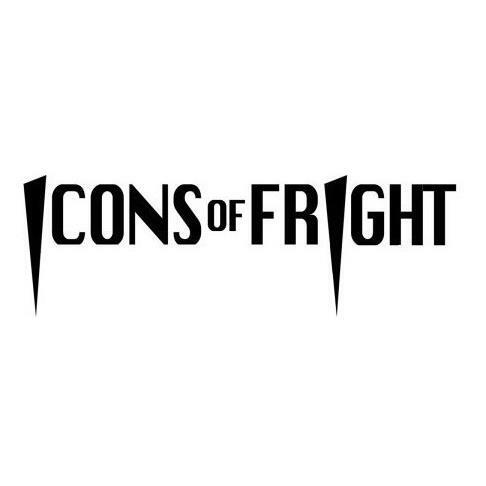 The publisher is going to launch in July. One of my major characters struggles with OCD. Q. What’s the title of the book? A. Insurgency. It speculative fiction, a thriller-horror novel set in Chicago in the present day. Q. You scored the Bandits stadium in Rosemont for the fundraiser? A. The village of Rosemont just said hey, we have the keys to the castle here and you get to use the castle. It’s the finest women’s sporting venue in the country. Q. How many people are helping out? A. At least 100 volunteers. Q. Have you ever organized a fundraiser before? A. Striking out Breast Cancer for a wife of a teacher at West Leyden. Another larger fundraiser for a board member’s wife. Knocking out Ovarian Cancer. This is really my third fundraiser of substantial size. Q. What’s this one called? Q. Part of the fundraising will be people paying to hit one of the ballpark. Will you be pitching? A. There will be a rotation of about five pitchers. I have some former Division 1 college standouts. I probably will do a little bit of pitching. Q. Where will the money go? A. Beyond OCD, a Chicago nonprofit that works on OCD. It was a one-woman outfit for seven years. She was recently able to hire a part-time assistant. She has a website with a bunch of useful tools that people are using to help cope with OCD, particularly people who lack insurance and based on geography. She survives on charitable donations and fundraising. She gets just over 300,000 hits on the website. We’re in 2014, this is a digital civilization we’re living in. She’s creating useful tools for people who need it.